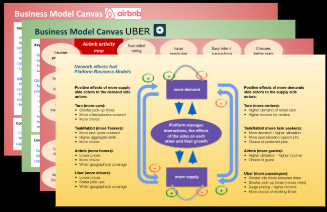 The platform business model is undoubtedly the most important and revolutionary business model of the last decade or two. Google, Facebook, Alibaba, Uber, Airbnb, Paypal and many other of the most successful startups are built on it. In the last 4 articles, we have already covered the platform business model in depth. Today, we are going to have a look systematically how to get started on a platform business. You can use this to get your owns innovation ideas started. 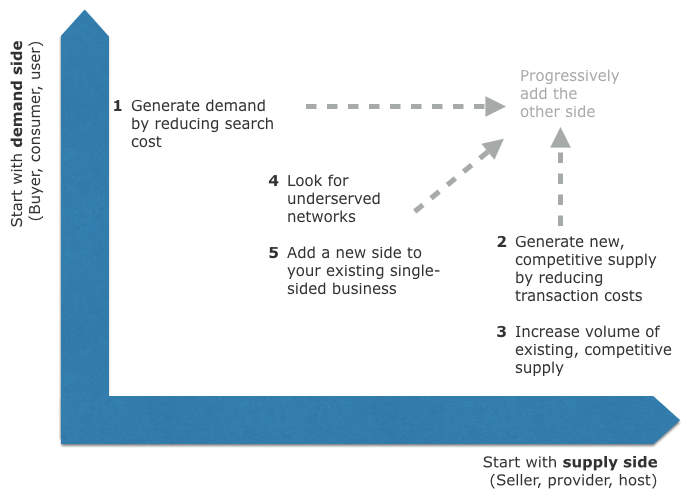 Generate demand by reducing search cost: help the demand side (i.e. consumers, buyers, users) finding things they are looking for easier and better. This helps your platform to get a foothold in an industry and expand from there to the supply side (sellers, service providers, etc). Generate new, competitive supply by reducing transaction costs: bring new suppliers to the market by making it easier and cheaper for them to provide services or goods. Increase volume of existing, competitive supply by lowering transaction costs for established supply. Look for underserved networks and give them what you feel they are after. Get users on board and then take it from there. Add a new side to your existing single-sided business: expand your existing assets and infrastructure to bring a new side onboard. Your platform idea will most likely make life easier for the demand or supply side first. Over time, you will add both sides. Structuring the start-up strategies this way will help you to crystallise your idea. Actual costs, e.g. when going through a broker, or agency (e.g. real estate, recruitment). Time & effort, e.g. researching your next holiday destination & planning your itinerary. Skills/knowledge, e.g. trying to compare different offers (e.g. tech gadgets). Inefficiency, e.g. an empty driving taxi not knowing there is a passenger looking for one just a street away. Being findable, e.g. no access to the right markets (where the consumers are). The company/provider has to spend money to reduce search costs for the consumer. Building reputation, e.g. getting discarded (or filtered out in search queries) due to not having a known (brand) name. The company has to spend money build a brand or appear more trustworthy. Yelp is built on crowd-sourced reviews of restaurants and local businesses. How do you find a good restaurant? You can try out different ones and see how you like them. You might be lucky or not. In the latter case, it has cost you time and money (=high search costs). Having the dining places in your search area reviewed and rated will help you find something that you will like (and match your mood of the moment). This is a good way to reduce search costs. It also reduces another mental barrier prior entering a transaction and that is uncertain. It also helps those restaurants that are good to get more visitors with less (local) advertising costs. Yelp.com has over 100 million reviews (as per early 2017) reducing search costs for some 150+ million users/visitors per month. But what is the value add? Economic theory says that, as prices fall, demand increases (and it depends on the elasticity of the demand and supply function by how much). But the thing is that search costs – even if often intangible and immeasurable – need to go into this equation. This is where search cost reducing platforms come in. They generate incremental aggregate demand. Some of it may be taken away from other restaurants (substitute). But without any doubt, there is also a portion of new demand that would not exist without the platform’s service (i.e. people stay at home). This is where search cost reducing platforms come in. They generate incremental aggregate demand. Some of it may be taken away from other restaurants (substitute). But without any doubt, there is also a portion of new demand that would not exist without the platform’s service (i.e. people stay at home). A Harvard Business School study published in 2011 found that each “star” in a Yelp rating affected the business owner’s sales by 5–9 percent. A 2012 study by two Berkeley economists found that an increase from 3.5 to 4 stars on Yelp resulted in a 19 percent increase in the chances of the restaurant being booked during peak hours. A 2014 survey of 300 small business owners done by Yodle found that 78 percent were concerned about negative reviews. Remember what we said. Platforms often subsidise one side and often charge only one side when in reality both sides derive benefits. You could argue that the user side also pays by contributing reviews and ratings. And of course, there are free-riders who don’t bother to even rate the restaurant that they found through Yelp. Some will point out that review writers and review consumers are different sides of the platform. They would see the restaurants as the third side. If you prefer this view, feel free to conceptualise it this way. Don’t forget though that most users will be in both roles. Many users who find a restaurant through Yelp will either write a short review afterwards or at least give a 1-5 star rating. This is why I opt for the more straightforward view of 2 sides. The idea for Groupon (“Group” + “Coupon”) was born from asking for discounts when getting enough people interested in an offer. Merchants offer special discounts for a product or service for a limited amount of time (or contingency). The offers serve as quantity discounts or sales promotion. It is a very direct way of generating additional demand and reduced pricing. These days, Groupon is the go-to point for all people seeking deals. They aggregate and channels demand and encourage consumption. 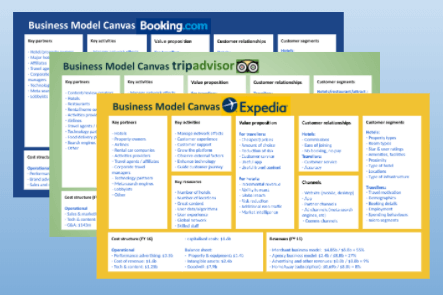 Many booking & reservation platforms have started in a similar way, such as Expedia.com. Reduction of transaction and search costs can help make existing supply more reachable and competitive. It can also help generate new demand and supply in many various ways. In reality, all platforms will try reduce several types of search and transaction costs. More on search costs here. There are uncountable ways of reducing transaction costs. Depending on the industry, different types of transaction costs play a role. Traditionally, large corporations (I am speaking of non-platform businesses) have internalised transaction costs and with increasing scale minimised those. According to economic theory, this t is one important reason for their existence. Taskrabbit – does the same thing but for local real-world services. It did exist previous to online platforms in form of local newspaper classifieds, then in the form of online classifieds. But platforms like Taskrabbit have added genuinely new supply by making it almost intuitive for people to join on both sides. Food delivery – focussing on one particular transaction cost and that is transport. but they have to yet figure out how to be profitable. 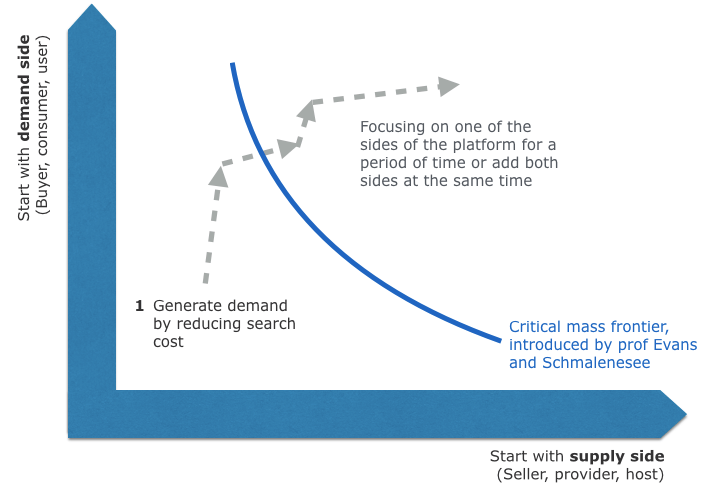 The platforms listed here have also reduced search costs for the demand side (consumers, users) and thus created new demand as described in (1). But the approach listed in (1) starts with the demand side. They don’t need to interact with the supply side in order to get going. Having to worry about only one side should make approach (1) an easier starting point. Uber – has reduced search costs for both sides drivers and passenger significantly. They have reduced transaction costs in multiple ways. But they have taken the next step which is helping interested drivers get a loan to buy a vehicle. This reduces barriers to entry for those who would like to become an Uber driver but don’t have an appropriate vehicle and potentially are at the edge with their credit rating. Uber can help their case with future anticipated earnings. The previous approach was different in that it does not rely on existing supply. Yes, it utilises existing assets (cars, homes, etc) and human capital. But these were not accessible supply prior to the existence of the platform. Now we are taking it a step further. We are looking at platforms that help existing businesses to reduce their transaction and search costs and thereby connect them with the demand side in a competitive way. One of the most successful platforms in this field is Alibaba. 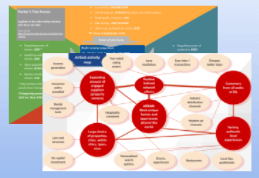 and absence of mechanisms to evaluate the trustworthiness of trading partners. These are all some form of search and transaction costs. Alibaba is helping small businesses to overcome these on their two B2C platforms. TMall specialises in branded and often more upscale products. Taobao is for small merchants. Both combined feature a staggering 350 million storefronts (more than the US population). When it comes to fragmented supply, i.e. many small disbursed suppliers, platforms are able to do a good job bringing them onto their platform. Alibaba does this in China. Ebay and Amazon are examples in the West. Both sources point out that from the mid-90s to the early 2000s economists, hedge funds and venture capitalists discussed how large the B2B market would be. Goldman Sachs, for example, estimated it to be a whopping $4.5 trillion dollar industry in the US alone. Others were even more optimistic! By late 2001 it was a close-to-zero-dollar industry. Most of the over 1500 start-ups went bust in the dot-com boom-bust cycle. Economists Evans and Schmalensee state that in the US friction (i.e. transaction costs) were not substantial enough for platforms to lower these costs substantially. They also state that some of the B2B platforms argued that they would get the best price for buyers which however happens to be the worst price for the sellers. Though this could be overcome through subsidies to the seller side, there was not enough friction to overcome to add enough value to the other side to pay for these subsidies (plus the platform). Modern Monopolies have a different read of the B2B burst. They believe that many of those industries were already consolidated with only a few big players sharing the market among themselves. And of course, these players did not want another middleman thus didn’t sign up to the respective platforms. With the supply side boycotting the platform, the platforms could never achieve critical mass. Both point out the success of Alibaba which was grounded in the fact that they unified a large number of small vendors. This is true. Add to this that Alibaba also has a huge B2B platform. In fact, many of the sellers on Taobao and Tmall source their supplies from Alibaba’s B2B platform. With a large number of small sellers, there was enough value for the bigger wholesalers to join Alibaba as they could sell to the small sellers. This has made Alibaba an end-to-end B2B2C platform. Steve Jobs got the record labels to sign up to sell their music through iTunes. The labels seemed almighty for a very long time. But Apple had built a huge demand side with the iPod and iTunes. At the time, Napster (and piracy in general) also put the labels under pressure. Jobs had some clout (though nowhere as much as after the iPhone), but even then it was a huge feat to get the label to sign up becoming supply-side to iTunes. Nevertheless, it shows a possible path on dealing with a consolidated supply side. Ebay did not ask the big players to sell through their platform and yet they are one of the biggest online marketplaces that increasingly takes away market share from brick-and-mortar stores. Airbnb did not ask Hilton, Marriot, or other big players to join. They identified possible fragmented supply and brought them to the market. They most likely didn’t expect they would be so directly competing with the big hotels. Otherwise, they would probably not called themselves Air Bed & Breakfast. In any case, the B2B space is still a field with relative few platforms. This should be a great opportunity in my eyes for established companies to come up with their platform. Apple’s iTunes intruded into an adjacent industry and this could be a starting point for your thinking. More on transaction costs here. Now, the above strategies have a defined starting point (either demand or supply side, etc). But you can still get started if you don’t know exactly what the endgame looks like. In fact, hardly any platform would have started with a master plan and gotten there without pivoting. Facebook has started as a network connecting students on the Harvard campus. This is a fairly limited network. But Mark Zuckerberg sensed there is a need for being connected better on their campus. It allowed users to interact better than by phone or email. And it had the benefit that you knew you are on the same network as similar people (overcoming trustworthiness issues). From there, they expanded to other campuses. Once they were established on campuses, they opened their network further. I have described the benefits of getting to critical mass using this approach last time. Like many platforms, Facebook didn’t know what their monetisation strategy will be. They started with getting users onboard. In the early days, they attracted also a lot of traffic with games (remember “Farmville”?). And who knows what would have happened if they had decided to fully focus on apps. Maybe they would have been the biggest app store in the world by now. But they focussed in on advertising (and they are doing extremely well). In any case, building on a limited, under-served network is another strategy to get started. 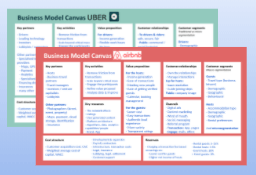 The idea is to initially get users on board and pivot as required. If you already have assets serving a single side, this can be a great starting point to add another side. Many platforms started this way. Maybe you can add another supplier side to your customer side. Or possibly add a customer side to your supplier side. Or you can extend your assets in a new direction altogether. Amazon, e.g. opened their retail platform to other sellers, thereby creating competition to themselves on their own sales pages. But they have also added more variety to their catalogue which attracts more buyers who may buy more Amazon products. 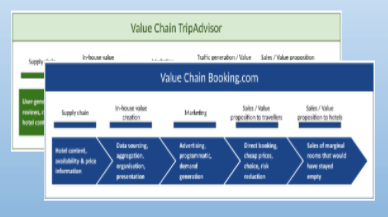 I believe this approach can be well suited to Software-as-a-Service (SaaS) companies. Professor Parker sees Google, Amazon, Facebook and iTunes as accidental platforms. This is not meant in a derogatory way. But if you study how these platforms came about, the clear impression is that their inventors did not even remotely anticipate the magnitude of their idea. Is your industry already listed? If not, list it … Personally, I believe there are tremendous opportunities even in those fields where large platforms have already emerged. I don’t believe you will be able to start with a master plan where you tick off one planned milestone after the other. But that doesn’t mean to leave your ideas to chance (or never get started at all). You can study how other firms got started and how they achieved their successes. Learn from them and apply the lessons to your ideas. What is your starting point idea? What is the core transaction? Is it in your industry, an adjacent industry or an altogether different one? 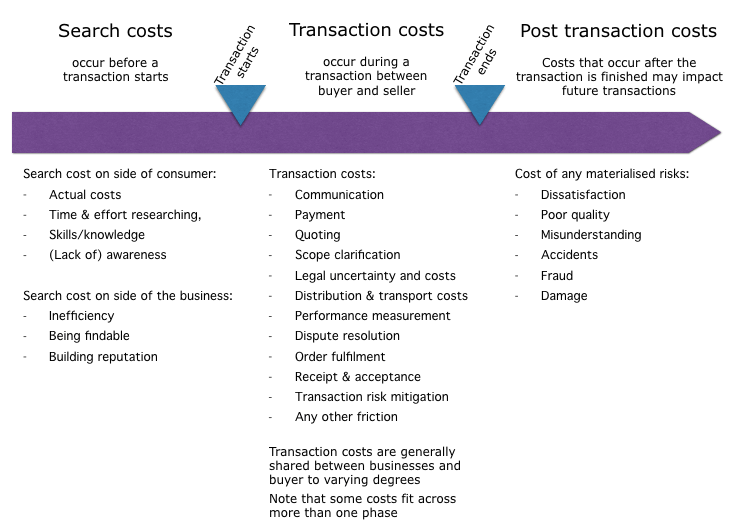 Which transaction and search cost improvements can you deliver? What is the value your idea adds? Who benefits in which ways? Which of the approaches above is the best starting point for your ideas? Are you starting on the demand side or on the supply side or using another approach? Is the reduction of friction and associated cost savings sufficient to provide competitive offers? How could the numbers look like? 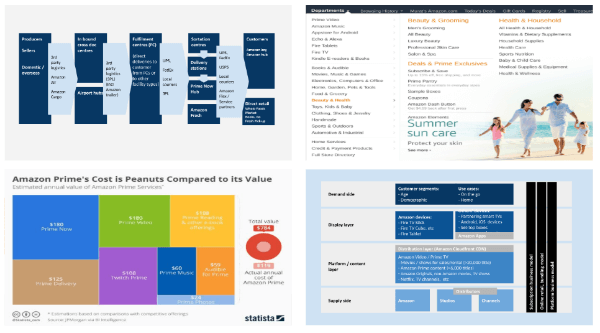 Over the last 2 months, I have covered the platform business model extensively. I believe it is the most revolutionary business model of the last decade. And we are starting to understand it better. This gives us as innovators the opportunity to apply its principles to our own ideas. 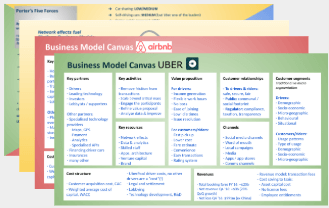 I am also covering in-depth examples on the platform business model. If you liked this article, please share. I appreciate it.